A first on Earcandy Express, it’s a collaborative post between BUMP This (Music4urSoul), fangirltainment (fangirltainment), NyNyOnline (NyNy) and saranghaejkpop (Saranghaejkpop)! I am pleased to get this started as I have wanted to do this collaborative post for a while and it is finally happening. ^^ This is only part 1 of the collaborative post on Earcandy Express and it will carry onto one of our other blogs. 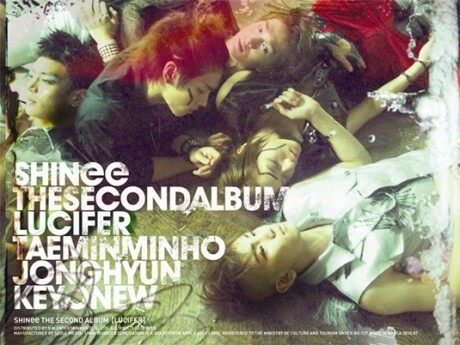 For now, we are posting our review on SHINee’s 2nd album, Lucifer. Hey everyone! Fangirltainment here. I’m prefacing this review by letting you know that I generally love SHINee. I think they’re a strong group and I’ve liked a lot of their music in the past. However, some of their music can be hit or miss for me. Consequently, I end up sounding super critical in my review. I don’t mean it! Well, I do write my honest thoughts, but I wanted you to know that this is all coming from someone who enjoys SHINee a lot. Interesting beginning. Singing on each note creates an elongated effect and if down in the right way makes the song that much better. Placing Taemin and Jonghyun’s voice together really shows how much they sound alike and also shows how higher Taemin actually sings. I would’ve preferred the opening of the song to start with Onew singing because it draws you more into the song. Also with this, the song really does sound less awkard. Minho’s rap bridge is always appreciated in the song because it brings it that much more depth. I’m not into the way this song starts. It makes me want to skip the entire thing. Something about it just grates on my nerves. Once we actually get further into the track things get better, but we never get rid of that refrain, so this song just ends up being one of my least favorites on the album. I love SHINee, but I could do without this song. I find Up & Down pretty relaxing whenever Key says “Hey baby…” and I loved that they did this song for their comeback before Lucifer. Nothing much I can say but another good song that SHINee has done. The intro is annoying; just so high pitched and not exactly what I want to listen to. Thank Minho for saving the song with the rap. Definitely the right song to be picked as the album’s title, this song brings a lot of their “Ring Ding Dong” feel to a whole new level. The lyrics “Her whisper is the Lucifer” is one of my favorite lines ever and contrary to the different pop songs it has more of an electronic pop beat. The melody itself sounds like a softer verison of dubstep without the re-verb but offers a lot of the same qualities that make a song dubstep. Course the title track can’t go unnoticed. This song definitely upgrades from Ring Ding Dong and beats last year’s hit Juilette. Despite the thousands and thousands of comments on allkpop and K Bites, SHINee showed them all that a concept is nothing without hearing the song first. I’m still skeptical when I listen to this song because of the title, but other than that it’s like Ring Ding Dong 2.0. The strong beats definitely make is addicting and it’s fun to see it performed. SHINee sings on top of house beat which is different since all their voice are sung so softly. It reminds me of old Shinhwa songs that would best summarize as “Crazy” and “Hero” meshed together. I seriously do not mean to be so critical of this album, but it just has a few points I’m not into. I love the vocals in this song, but there is SOMETHING I don’t like. I guess I can give it credit for being different than a lot of K-pop songs out there, but it’s just not my favorite. There is some dissonance with all of the ad-libbing etc. going on here. I think I’m crazy for missing this song, normally when I hear songs I listen to the beat for the first 5 seconds and if it doesn’t stand out or draw me in, I don’t listen any further. But it’s a pretty good song, reminds me of Pharrell in a way the way they sing as if they are whispering but not what I want for my iPod. While I really want to love this song, I can’t because of the changing keys and the talk/whisper. The beat is all over the place in the chorus and I just don’t dig it. On the sample preview, this was actually one of the songs I really wanted to hear and it turned out to be really reat. There’s a lot of people that I know that hate that “hey” chant in the background but sometimes it adds more flavor to the track. The song is very easy going and something more of SHINee genre. The track doesn’t enhance or reduce their vocals but that doesn’t something matter because in a sense, everyone enjoy the same track means a lot more too. I like the feeling of this track. It’s light and bright and generally upbeat without being in-your-face. I’m not over-the-moon in love, but I can easily say I like it and don’t mind listening to it. I would have to say, A-yo is perfect for the summer whenever your on the move. The beat is uplifting for me and I can’t get enough of listening to it. A-yo is a really cute track! It’s so dance-y and chill; I like listening to this when I’m relaxing. Just on the instrumental intro alone, you can tell that this track has more substance. The beat is smooth and the SHINee’s vocals complement the song well. The bridge sounded a bit rough, both the melody and being sung on it, but the song overall was very well done. Minho’s rap in this song has to be commended because he gives the right tone and flow and you can hear the angst in his voice. I appreciated a lot of the instrumental melody that flowed in this song. I like the way this song starts. It’s pretty good for a slow track; SHINee is one of the only idol groups that pulls off ballads and lower tempo songs, in my opinion. I mean, they do it well without getting boring. I think Onew and Jonghyun’s voices are incredible, and I quite like Key as well. Of course, Taemin and Minho hold their own, but you must admit that their vocals aren’t as rich as the other three. Anyway, I enjoy this song a lot. I find that it ends as well as it begins. This would be my choice for everyone to listen to, I think it’s the best song on the whole album. My favourite track. I wasn’t sure but hearing how the song starts, I had to get it. I listen to it more than Lucifer. I love the beat! It’s a hip-hop feel and Jonghyun’s voice is so smooth. This song is a nice medium between Lucifer and a slow song like Quasimodo. Their first ballad song on the album, Quasimodo wasn’t that aweing as I hoped it to be. The song shares some spotlights here and there but overall it sounded like “In Your Room” part two. The way this song begins makes me “sad.” The song is good, but let’s leave the “ooh-ooh-ooh” bits behind, right? Okay, moving on. Like the last track, this one is fantastic for a slow song. SHINee knows how to do ballads right! I love the chorus. I agree with fangirltainment, the song makes me sad but somewhat too sad to like. Ballad’s have to really touch me or be mid-tempo R&B for me to accept. Unfortuantely, Quasimodo is not for me. I agree with Music4urSoul, it does have a ‘In Your Room’ feel and that probably why I like it so much. It’s very soft and dreamy; no it doesn’t have the swept up feeling of most ballads,but it’s a good listen. A serious Minho geared song, this track was a nice break from the contemporary songs that were on the album. It’s a hyped up track with a lot funk and soul. I would’ve liked to see this song performed live because it has a lot of energy and would’ve probably rocked all the music stages. Jonghyun’s bridge on the song hits the top ten of music bridges that I’ve heard. Like a lot of tracks on this album, I have a few things that bother me with this song (the money noises, gutteral noises?, Jonghyun’s (?) “ahh”), but despite them I end up liking something about it. Maybe it’s ~inspiring~ with all of it’s “I don’t give up” repetitions, haha. I guess it’s an okay song! It’s just not my favorite. Starting a song with the sound of a moneky is a little strange, no? But making up with the beat of this song does the trick. I think this song could be considered as part 2 of Get Down yet the other SHINee members get a part in it. I still don’t get the moaning noises from Jonghyun, who told him to do that?! The whine/grunt/moan is hilarious and I can never listen to this song without cracking a smile. This is another fun track that would be fun to see the video or performance. Minho’s track!! This psychedelic funk track is meant for to be light hearted and fun. However, I’m such not a fan of auto-tune that it turns me off the whole track. It’s very hard for me to like cute cute songs because it’s so saturated that it makes me repel them on instant sound byte. This is a pretty fun song. I could take or leave it, to be honest, but since it’s here in front of me I’ll just sit back and listen. It seems rather sweet and cute. It reminds me of Justin Bieber a little? I’m not sure why. I think it’s the tempo. It’s as if SHINee wanted to try something new and decided to use a strange funky beat and saranghaejkpop is right, it does remind me of The Lion King especially Hakuna Matata. Hahaha, strangely Taemin’s “woah” suit the song too. The beat immeditely reminded me of The Lion King Movie and Love Like Oxygen. Super Cute song, with too much auto-tune for me; don’t really like it. The chorus is one of the things that attracted me to this song the most however, the rest of the song along finishes with an “okay.” The acoustic beat again nods to their contemporary genre that makes them SHINee and it shines through the chorus lines. Every time this song pops up on “shuffle,” I skip it. It’s not a terrible song, but I find it incredibly boring. It seems like something you’d stick on a mediocre drama soundtrack for unnecessary montage scenes. The chorus saves it from being completely dead to me, but I wish it (on the whole) had more “umph” to it. The start of the song is like a start of a good day. It starts off with the harmonising really beautiful and it makes me feel like everyday is summer and somehow needs to be in a modern rom-com movie or fairytale. Not my type of song though. The harmony in the intro is so beautiful, then the song actually starts and I just want to get to the harmonizing. Very chill, but I wouldn’t listen to it unless it just comes on my iPod. This ballad is such a sweet song and was really done beautifully. Following the traditional Korean song tear jerkers, the piano melody accompanied with some nice highlights make this song OST ready and also head sway worthy. Onew and Jonghyun’s concentration vocals really develop the track to position itself on another music field. Since I’ve annoyingly (for almost every song) said which tracks so far have the best or worst beginnings, I’ll continue on that vein! “Life” has a good beginning. The song in general doesn’t stand out to me, but it’s pretty and listenable. Life is a pretty calming ballad towards the end of the album – or near it. It sounds like a good song to relax to. I wouldn’t be suprised if this became an OST song. I’m a sucker for ballads and this, while very nice, it doesn’t have that whole feeling that I usually feel when listening to ballads. This song is one of my least favorites and sounds like something Ke$ha could probably sing in her voice. The type of songs that have more spoken words then sung voices with a twist is a new trend that is developing both in Kpop and internationally. Electronic pop that has dash of auto-tune doesn’t sound that bad if you didn’t care for auto-tune in the first place. Good, upbeat song. I like that it has a bridge-y, pre-chorus-y thing going on. It’s nice to have a song with different aspects to it. I also like that we get something different from SHINee with this track. Another upbeat song for the summer. SHINee really didn’t disappoint fans. The song is a little odd. It starts off to the point where you feel it’s the bridge but upon entering it, it becomes a little softer before the beat kicks into the chorus. Fun, fun, fun! This song is like the definition of summer.As much as I love this song, I get tired of the auto-tune. I think someone needs to get “Love is Pain” out of the Kpop lyric vocabulary because it’s traveled over a good set of years and can now retire. The scaling of the song and lyrics creates a grand effect that contrasts a lot from the original track and is nice to hear for the first time on the album. Not a particular song I would put on repeat, it still outweighs some songs that were made popular on Kpop charts. WHY ARE THERE SO MANY SLOW SONGS ON THIS ALBUM? Alright, so it’s not particularly a ballad, and we’re talking about SHINee here, but I’m sensing a huge lack of balance with the “Lucifer” album. It’s okay with a few songs, but songs like “Love Pain” are just AVERAGE to me. I don’t mind listening to them, but I have hard time remembering they exist two seconds after the track ends. Why didn’t I listen to this song beforehand? It’s a mid-tempo R&B beat that I like and listenable. Very sweet to my ears, I really like it but perhaps it’s not as good as Obsession which caught my attention immediately, this song seems to need to take time to grow. Very R&B,I like it. That’s it; just like. This song doesn’t really stand out when remembering the album. Not the worst track, but not my favorite. A very good song to end out the album, the song hits top three in my opinion. It attracts enough of the pop and is something that hasn’t been done before. Although people hate comparing, I can’t help but compare them to Shinhwa since their song have so much in common! It’s very energetic, without being heavy, and has some fierce attitude but not enough to blow you away. A track filled with flavor and depth with the electronic beat that makes them SHINee, this song overall defines the group. Is this kind of like a remix of “Love Should Go On”? It’s different, but it has a lot of similarities, especially in the beginning. Either way, I like both songs and think this track is a good way to end the album. Nice way to end the track with a nice nod at their first mini album. It’s faster and even more addicting than the first time I heard it! So to conclude, there’s nothing that I can say about SHINee because they never disappoint despite the haters. And I’m mainly glad Taemin’s part has increased dramatically along with Minho getting a fair share of lines since last year. Though there were a few songs that disappointed me, I liked the album overall. It’s an upgrade from SHINee World. To conclude, I have to say I have mixed feelings about this album. It has some really enjoyable songs on it, but it has an overabundance of boring, filler tracks. Honestly, I think the producers were so bent on giving SHINee another full album that they just threw whatever they could in. If they had gone with a mini-album/EP format, they would definitely have enough for a strong album. All in all, however, it’s a good album to just sit and chill out to. I tend to gravitate to songs like “Lucifer,” “Obsession,” and “Quasimodo” when it comes to this album, but it’s a decent effort in general. Lucifer wasn’t as diverse or strong as Year of Us. I like tracks: Quasimodo, Lucifer,Obessesion. I wonder what they will bring with their next album. Oh me too. I’m glad we had a big collaboration post, it was fun!